Travelling to new cemeteries is always an adventure, even when I bring my copy of The Natural Burial Cemetery Guide which I have been known to forget. Pine Forest Memorial Gardens in Wake Forest, a half-hour from Durham, North Carolina, was no exception. Tom and I had to wend our way through quiet suburban streets to find it. Luckily it was a damp, overcast morning, before the summer heat made its way into the day. A Will for the Woods, an iconoclastic documentary of the movement. But manager Dyanne Matzkevitch seemed puzzled that people think it came about just because of Clark. When I asked her if he had been the inspiration, she said yes but "We buried people there before he died." Nevertheless, the way to reach the Garden of Renewal is via the Path of Clark's Reflection, which wends its way between the pond and a dense woods where a standpipe draining the pond sizzles the air with the sound of running water. My first meeting with Dyanne was at a screening of the documentary in New York City. At first encounter I wouldn't have pegged her as a natural burial advocate, but then I'm not sure anyone I've met in the field would pass as an archetype. Like most natural burial cemeterians Dyanne is dedicated to her work and her vision. She has gone slower than instinct tells her because skeptical owners think her odd for her passion, and are reluctant to expand until they see how it goes. Dyanne jumps at the chance to emphasize, as others have done to me, that with cremation on the rise, it's really green burial that's helping to save full body burial as a cemetery option. Natural burial is actually alot more work than conventional; funeral homes often don't know how to play their part, and sometimes people want to do it themselves, which is difficult. It's also, she says, a more emotional experience. My first and lasting impression of Dyanne's woods was of lots of burials, many of the mounds more fancifully decorated than might be expected for natural burial but a surprising percentage of burials here, both natural and conventional, are of children. The Garden of Renewal is also a way of preserving land that the cemetery owns. 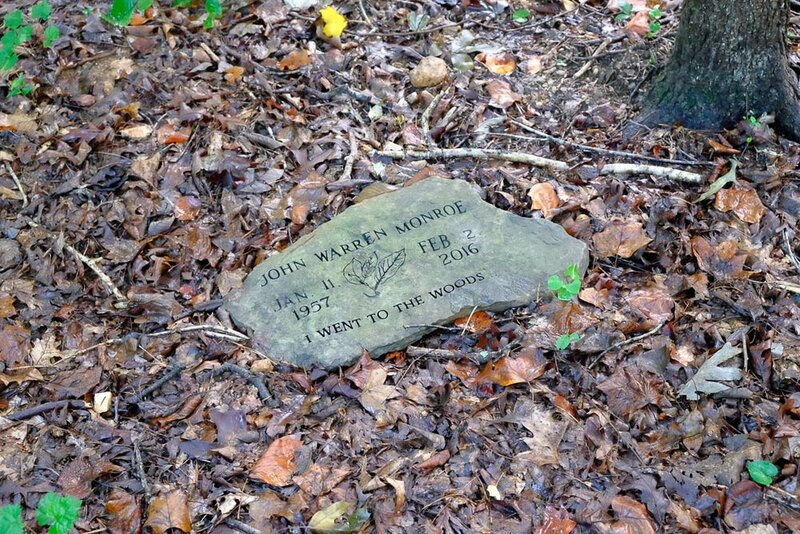 Clark's grave is marked by a stone engraved with a feather and "A will for the woods." He was only 50 when he died, a psychiatrist diagnosed with lymphoma who decided to take control of his afterdeath disposition and chose green burial. At the time there were no such options available to him. In answer to his plea for green burial space Dyanne opened her garden, and in the two years until his death, buried a number of bodies and sold plots. 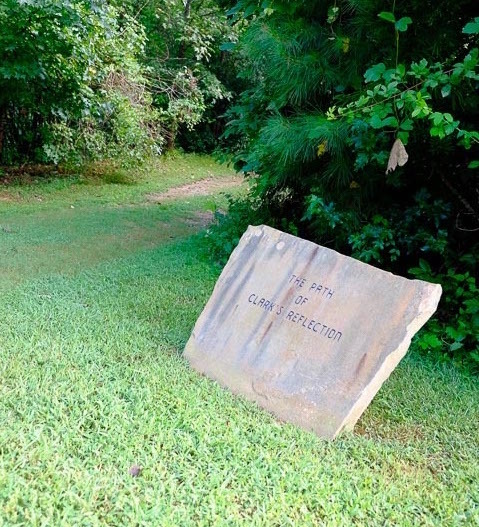 Between then and now she has patiently leant a hand to others in the area starting up green burial, especially Robin Simonton, who credits her with helping when she developed Mordecai's Meadow in Historic Oakwood Cemetery in downtown Raleigh. Beside the door of the cemetery office are a number of small, engraved stones ready to go on burial plots. Their smallness, Dyanne says, encourages people to be creative. 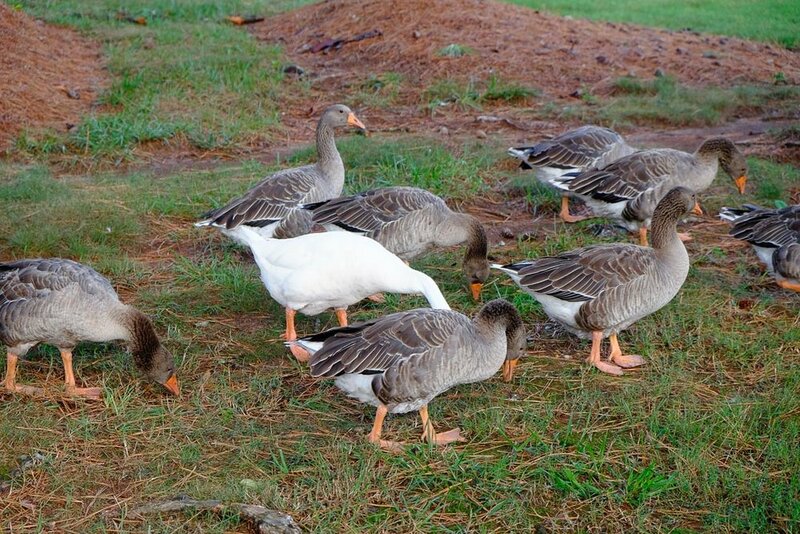 There are also ducks and geese in mixed flocks that call the cemetery grounds home. The woods are a lush place, a cool damp resting spot where a more recent burial than Clark's bears the inscription, "I went to the woods." Newer Post(Burr)ied in the Maine woods. Older PostI haven't marked my father's grave.